From 2007-2010, Thomas Talhelm, a volunteer participating in Peace Corps, recorded his Beijing life in his blog. It is quite interesting to read about the psychology, language, culture and (mis)communication he posted. The first blog I read was his complain about Peter Hessler, when I was searching Hessler’s interviews. “Hesslerhas ruined my China life. Because his books, my China adventure stories quickly became no more interesting than reciting the plots of famous movies.” He wrote. This article rated at the 4th when you searched Hessler in 2009, and it keeps its position. He took picture about hand-painted ad painted right onto the street, about the English graffiti on the wall. He described the misunderstanding in the interculture communication, though he was already a fluent Chinese speaker. He compared Beijing with New York City in 2008, the Olympic year. He observed people’s daily life, and recorded the changes. He post a blog about his visiting to the Great Wall. Salesmen there do have basicial bilingual ability. As the stream of people approached, the woman set in with her melodious pitch: “Liang Kuai, liang kuai! Five! Five!” In other words, the Chinese price was 2 Yuan and the English-speaking price was five, more than double. Being a foreigner in China, he got many benefits, such as guest-of-honor status in small town restaurants, frequent and hearty “helloo’s” when he walked on the street, and effusive praise of his Chinese ability. But he also experienced a foreign price. It is a pity he stopped blogging four years ago. If he kept doing so, he might be another Peter Hessler. Well… who knows. I wonder whether Thomas visited Silk Market near the US Embassy. The peddlers there can speak four or more languages to attract customers. It changes little. Three years ago, Mary, one of my foreign friends complained when she talked about her moments in Beijing. “I must carry my toilet paper everywhere.” It changes little, too. Though the country is developing quickly, some parts of the capital looks all the same. By the way, I’ve heard a joke about those salesmen on the Great Wall. 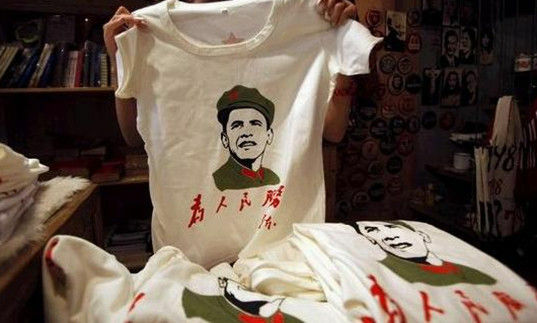 A T-shirt with the Chairman Mao style Obama is on the top of their sale list. Weeks ago, when Michelle Obama and her two daughters visited China, the Great Wall was one of their destinations. As a result, such T-shirts are prohibited for two days. I don’t think the T-shirt could irritate Mrs. Obama, the first lady. She could buy one as a souvenir. It just shows the unique Chinese humor, and reflected how popular President Obama is in the Eastern Country. I love this T-shirt! What about you? Years ago, the most famous foreigner in China is Mark Henry Rowswell. He is generally known as Da Shan, which means a huge mountain. His Chinese name is so well known that people nearly forget his original English name. Graduated from Toronto University, he came to China in 1989. Now He has been living in Beijing for 25 years, and married a Chinese wife. Nearly every Chinese knows him. Now, white-face foreigners are not rare animals in Beijing, even in smaller city as Hangzhou and Suzhou. College girls and their parents won’t talk about a specific foreigner. They discuss soccer stars, Hollow celebrities, just as the Americans. Thomas may not receive his benefits-for-foreigner now.